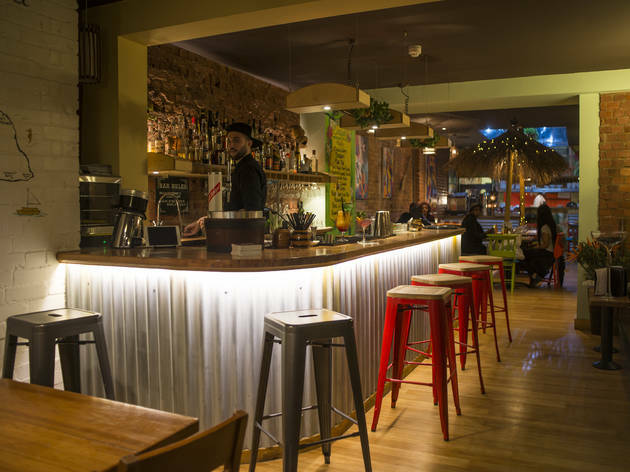 Jamaican restaurant with jerk wings, rum cocktails and reggae music. No cash for a Caribbean jaunt? 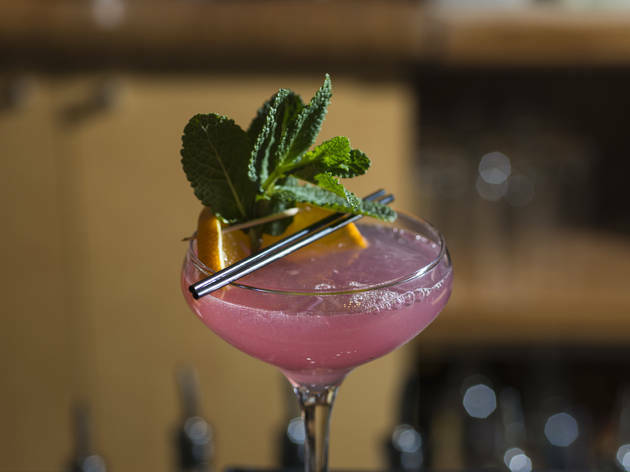 Then get away for just the night with the aid of this Camden newcomer. 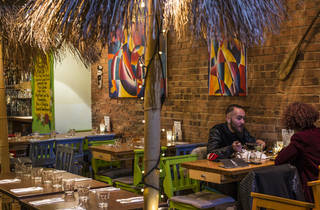 Bedecked with bright murals and beach shades, Ma Petite Jamaica – on our Saturday night visit – even provided a tropical temperature. Like most venues on Inverness Street, it is long and incredibly narrow. 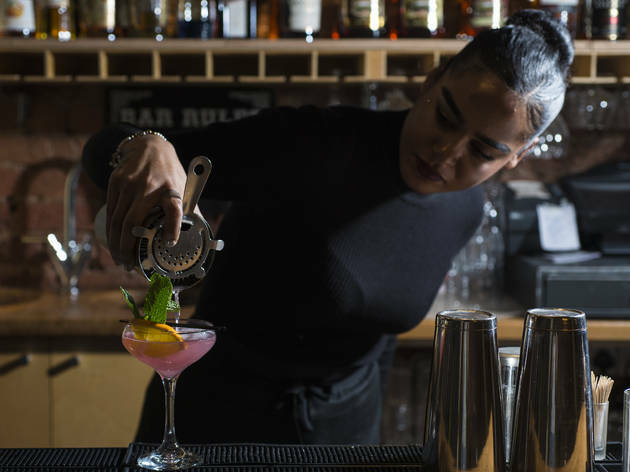 However, while rows of tables and the constant brushing past of busy staff kills off any chance of intimacy, they don’t detract from the experience. 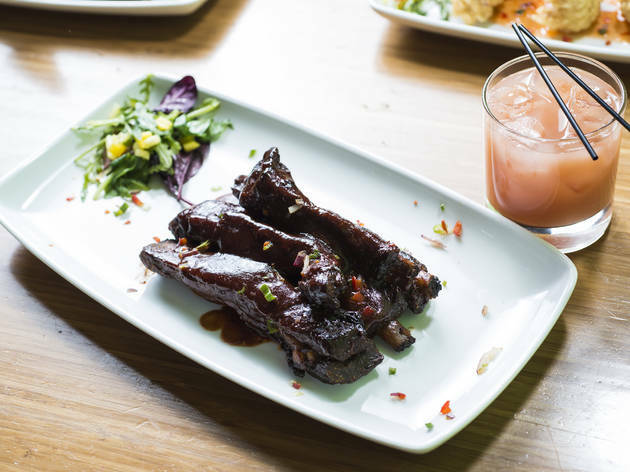 When ordering food, don’t mistake ‘small plates’ for starters: one is definitely enough to share, and friendly waiters are on hand to help navigate the menu. Our dumplings filled with jerk chicken were moreish, but the salt fish fritters were heavy and underseasoned. Main course portions were consistently massive and generally decent. Curried goat was good but messy, as the meat was served on the bone (not that we minded getting stuck in). 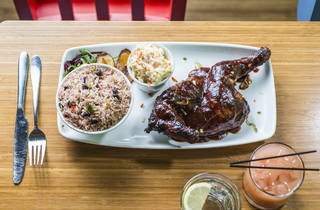 A main of fiery jerk chicken was moist and tender, smothered in hot sauce and served with rice and peas; while a side of coleslaw soothed the aggressive heat of the chicken. Cocktails, unfortunately, were a disappointment. 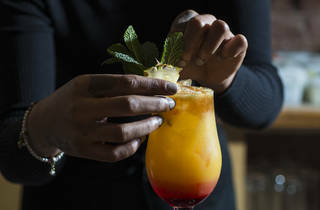 Average piña coladas were icy and the Killer Doppi (four types of rum, apricot liqueur, blue Curaçao and fruit juices) was choked with orange juice and so felt overpriced, especially when compared with the food. Still, at least there was Red Stripe on tap. 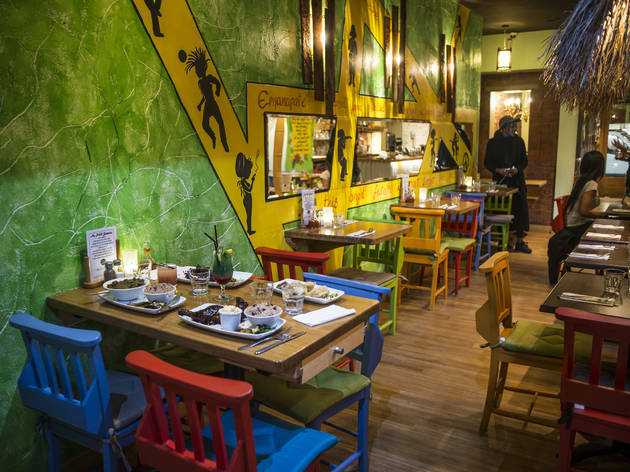 The odd let-down aside, Ma Petite Jamaica is a great-value, fun destination for lining your stomach and kicking off a night in Camden. Overall I recommend this place to visit, you'll have good food in a nice environment for friendly prices. A bright and sunny (if a little cramped!) restaurant in Camden. I went on a Saturday night, when it was extremely busy and rowdy but still great fun. 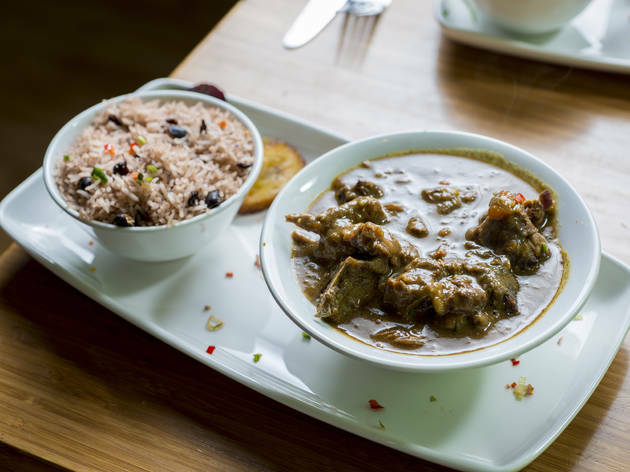 When it comes to food: go for the ‘small plates’ which is like a kind of Jamaican tapas. Try the dumplings filled with jerk chicken! Main courses are huge, making them great value for money. Curried goat was good and served on the bone but my favourite was the main of fiery jerk chicken smothered in hot sauce and served with rice and peas. 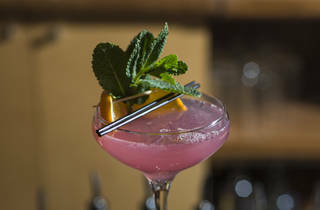 Dont' bother with the cocktails, they are the only thing that seemed to be over priced and fairly tasteless! Stick to the mocktails instead. 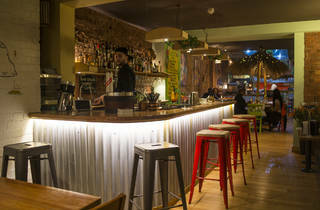 We walked around Camden, went to a few bars and along my walk, I noticed this little place which caught my eye. I was craving some jerk, so thought why not, lets pop in. They were pretty busy, but managed to get a table. It's a cramped seating area. Quickly ordered drinks which took a while for them to come. 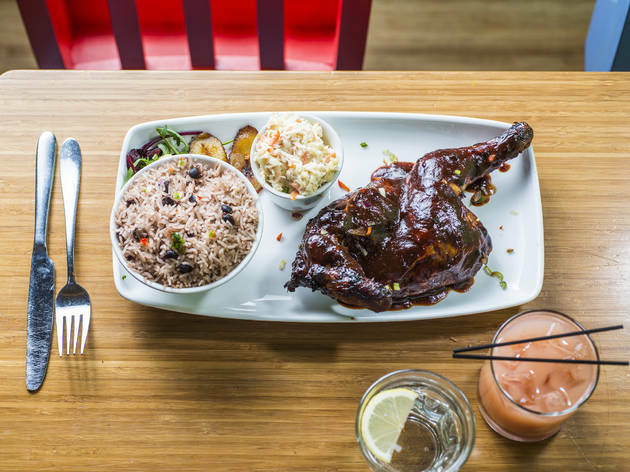 There is so much choice on the menu, if you are hungry you will probably order a lot, but I was good and opted for the 1/4 jerk chicken with coleslaw, rice and peas and plantains with also a side of chips. The sauce on the chicken was divine, the meat fell off the bone easily, the flavours were unbelivably good. However, the plantain was soggy and really oily, the taste was horrible. The coleslaw wasn't anything special either, the real hero here was obviously the chicken. Rice and peas was a bit meh too. For £8.50, you are only paying for the chicken, if you can, maybe ask to subsidise the accompanying sides. 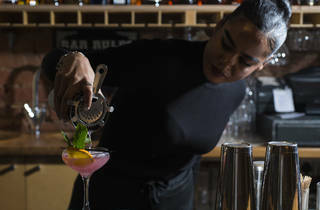 The drinks are overpriced for what you get. I have had better Jerk chicken. Service was relatively poor and slow. The rush did die down by 8pm, we left at 9pm. Not a place I'd revisit. 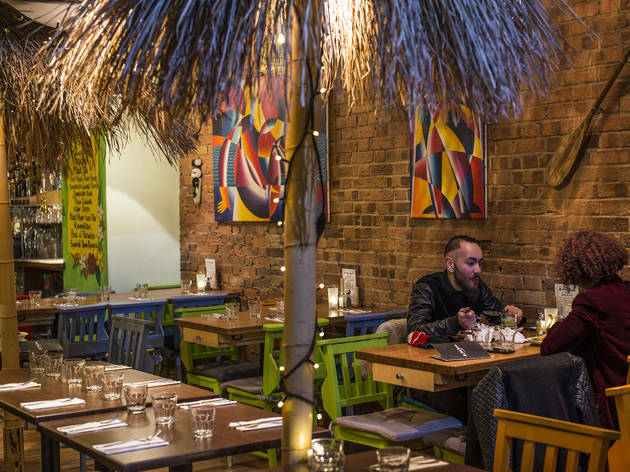 If you are looking for a caribbean restaurant which lives up to the stereotype of terrible service then you are in the right place. The service is slow and none of the staff there really seem to know what they are doing. I left the table halfway through my meal to visit the bathroom and on my return found that my food had been cleared. Upon asking the waitress why they took my food away when i clearly wasnt finished she responded "i didnt take your food" as if to imply the food magically disappeared by itself?? Shortly after the manager came over and claimed that a different waitress had cleared the food and i must have told her to do so. Not only was he very rude and condescending but his whole manner was very aggressive and made me feel like it was my fault for having gone to the bathroom without finishing my plate. After accusing me he then stormed off without offering so much as an apology let alone a solution to the problem. I was then served another full portion of my meal about half an hour later with no communication from the manager or staff. The treatment so far left me skeptical so i did not feel comfortable eating the food through fear that it had been tampered with in the kitchen. To add insult to injury when it came time to pay the manager stood over us to ensure we paid the full bill. So not only did he make us feel like liars but like criminals too. This place has a lot of work to do in terms of customer service. As a customer i did not find it fair that i had to beg for food that i was going to pay for. The manager there needs a course in how to deal with people because at no point in time was i rude or difficult but all i got in return was an unnecessary passive aggressive attitude. All in all my experience there was far from satisfactory and i definitely will not be back. I was looking for a place to eat before a gig at Koko and a friend suggested this place. 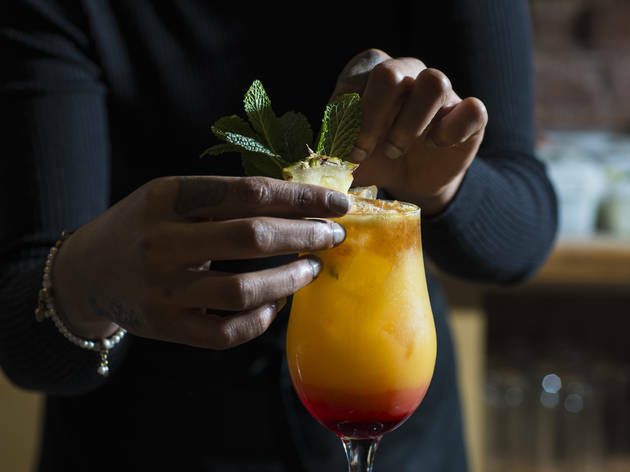 I'm glad they did; they do a mean curry goat and I loved the mocktails. Great value for money too. I really did not want to go to this bar my date had so painstakingly thought of. The guy proceeded to say it was a Jamaica restaurant and happy hour was still going. Oh those 2 magic words. Guaranteed to save any situation, and by jingo I had myself a 2nd date situation. 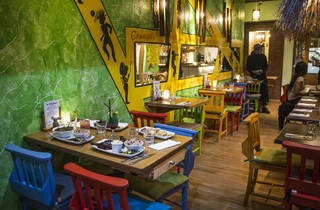 A colourful restaurant with reggae music blasting and tasty smell of jerk in the air, I see the first sign of hope. Red Stripe on draft. Glorious. My date was expecting a bar but little did he know I was getting hangry (I spelt that right. Hungry and angry= Hangry) and he needed to feed me before I ran off in a hungry rage. The relaxed caribbean atmosphere was lovely and as we sat down and ordered cocktails, I glanced at the food menu not to give my stomach the lead in this date. I had the Jerk Chicken wrap with sweet potato. It was heavenly and I could see my date was getting jealous so he had some too. The servers were very helpful and really nice. Unfortunately my date has not faired so well and I'll be going to that restaurant again without him in the future. Love this place. 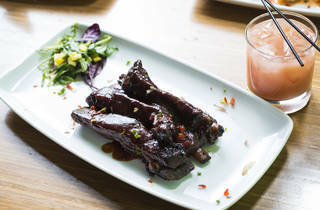 A fun restaurant that takes its food - but not itself - seriously. 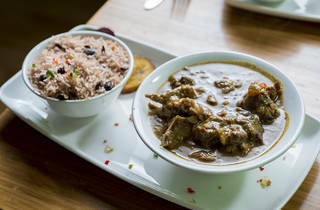 The curry goat is freaking fabulous.